Oregon, in the western Rocky Mountains, is home to legendary ski resorts with amazing views of The Cascades. Oregon is noted for big snowfalls, being part of the Pacific Northwest. 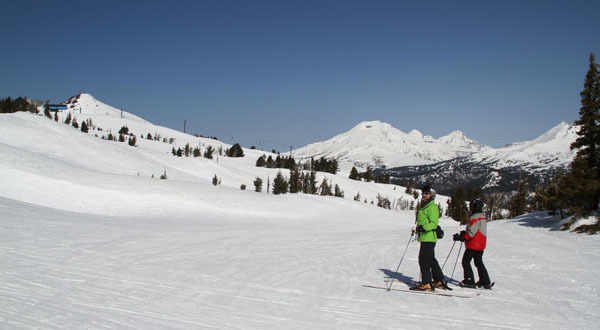 Namely Mount Hood and Mt Bachelor which offers skiing in all directions off the summit. Bachelor is the biggest ski area in Oregon and the Pacific Northwest, with 10 lifts, including 7 high speed quads, serving an impressive 3,365′ vertical and 3,683 vast acres of skiing and riding on a 9,065′ summit. The scenery from this splendid ski-able volcano is very special as you look out at Broken Top and The Sisters. A Mt Bachelor ski trip offers other fun activities for families from snowmobiling through the Deschutes National Forest and dog sledding to visiting waterfalls, deserts, crater lakes, and caves, and lodging at Sunriver Resort or the fun funky town of Bend at The Oxford Hotel. See our Mt Bachelor Ski Photo Gallery and our Mt Bachelor skiing videos. Mt Hood in Oregon is huge at 11,240-feet, though ski lifts only reach 8,540′. Mt Hood hosts three ski resorts and several glaciers on its amazing flanks, Timberline, Mt Hood Meadows and Mt Hood Skibowl. The beautiful Timberline Lodge at Mount Hood is well worth a visit – this stunning timber lodge built in 1937 now serves as lodging at the base of the ski resort which has an almost year round ski season. Mt Hood is where the US Ski Team trains throughout the summer. Mount Bachelor and Mount Hood both receive 350-500 inches annually and offer super long ski seasons on wide open above tree line skiing.